The University of Connecticut (UConn) and the University of Rhode Island (URI) are major public universities that, in addition to conducting extensive research for the Navy, contribute hundreds of graduates to the Navy and naval industries. 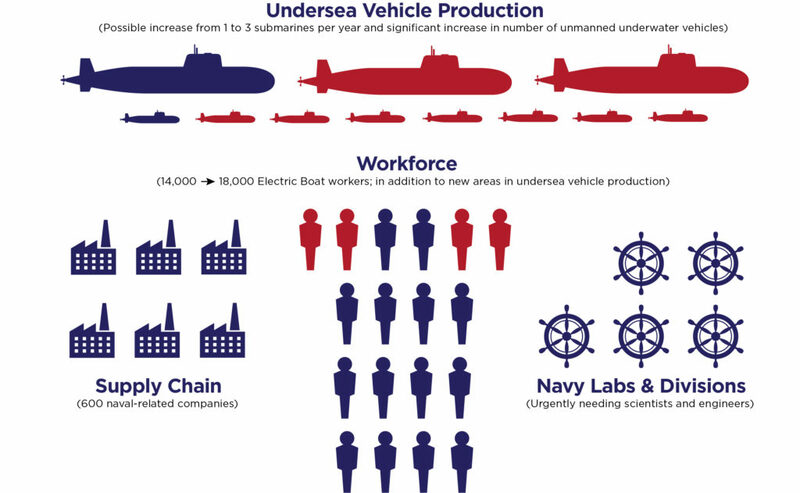 As of 2017, UConn and URI have approximately 1400 active alumni working at Electric Boat (EB) and the Naval Undersea Warfare Center (NUWC) in Newport, Rhode Island, annually provide approximately 125 engineers and 75 interns to EB. Naval science and technology workforce development opportunities for engineers are being made available by NIUVT to meet the naval workforce demands of Southeast New England and the Navy. NIUVT provides a range of opportunities to educate and train engineers for the naval workforce: from offering a minor for undergraduate engineering students as part of the Southeast New England Naval STEM Coalition designed to train students in naval technologies and to transition them to naval careers; to facilitating opportunities for current employees at EB and supply chain companies to pursue a M.S. or Ph.D. in areas directly applicable to their work. Please click on the links below to view more details about these rewarding education opportunities. Recognizing the region’s need to scale up the naval science and engineering workforce, UConn and URI have teamed up to create a major regional workforce initiative directed to undergraduate engineering students. The Southeast New England Naval STEM Coalition leverages resources at the two campuses and draws on industry and navy partners to deliver naval-relevant training.This Undergraduate Navy Crew will receive mentoring by Navy professionals and naval industry engineers, be exposed to the naval industry through a three semester seminar course, and conduct meaningful work in a year-long Senior Design Project at the direction of navel industries. Each year, senior design projects at UConn and URI can be sponsored by the Navy and naval industry to address a real-world technical or design challenge. The year-long projects are required of all engineering seniors at both UConn and URI, and teams of 2-4 seniors are mentored by university professors and by professionals from the sponsor organizations. Graduate-level masters degrees for working professionals in the Navy and naval industries are available at UConn through the Masters of Engineering (MENG) program and at URI through non-thesis MS programs for industry and a special MS program for Electric Boat employees. The Master of Engineering (MENG) degree is a part-time 30 credit graduate degree at UConn with both technical engineering courses and professional development classes. The NIUVT Master of Engineering program is focused on improving professional communications and project management skills as well as developing broad technical skills specific to naval applications. Students concentrate in mechanical, electrical, materials science or civil engineering or an interdisciplinary theme (with approval of the NIUVT faculty advisor) and complete and defend a final project related to a practical naval problem. The MENG program offers classes in an online/blended format in the evening to provide flexibility for working professionals so that they may pursue a masters-level degree in engineering concentrations to improve skills and develop knowledge in areas tailored to the needs of their employer. At URI, the Ocean Engineering, Electrical Engineering and Mechanical Engineering offer non-thesis MS programs, full-time and part-time study, for industry people and a special MS program for Electric Boat. URI was the first institution in the US to establish M.S. and Ph.D. degrees in ocean engineering. Areas of study include acoustics, geomechanics, hydrodynamics, ocean instrumentation, and water wave mechanics. The NIUVT Fellowship is a highly competitive and prestigious fellowship that is intended to be offered at both UConn and URI for engineers currently working in the undersea vehicle technology industry to pursue a Ph.D. in a field relevant to their employer and one of the many research technology areas of the NIUVT. The fellowship requires the student remain a part time employee at their company. Projects are identified through communication between the student, their company manager and a faculty advisor at UConn or URI. A stipend, intended to offset the costs of going part time, as well as tuition, fees and laboratory costs are provided. Applications for the first round of NIUVT Fellows are planned to be accepted in the Spring 2018 for a start date of August 2018. Please check back for updated information. 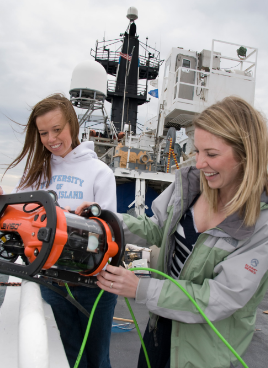 Two undergraduate students from URI's Department of Ocean Engineering test a small remotely operated underwater vehicle on board the Research Vessel Endeavor. Research experiences like this one are offered to students participating in the Naval STEM Coalition, which prepares students to transition to naval careers after graduation.